"Helicopters" redirects here. For other uses, see Helicopter (disambiguation). A helicopter is a type of rotorcraft in which lift and thrust are supplied by rotors. This allows the helicopter to take off and land vertically, to hover, and to fly forward, backward, and laterally. These attributes allow helicopters to be used in congested or isolated areas where fixed-wing aircraft and many forms of VTOL (Vertical TakeOff and Landing) aircraft cannot perform. The English word helicopter is adapted from the French word hélicoptère, coined by Gustave Ponton d'Amécourt in 1861, which originates from the Greek helix (ἕλιξ) "helix, spiral, whirl, convolution" and pteron (πτερόν) "wing". English language nicknames for helicopter include "chopper", "copter", "helo", "heli", and "whirlybird". Helicopters were developed and built during the first half-century of flight, with the Focke-Wulf Fw 61 being the first operational helicopter in 1936. Some helicopters reached limited production, but it was not until 1942 that a helicopter designed by Igor Sikorsky reached full-scale production, with 131 aircraft built. Though most earlier designs used more than one main rotor, it is the single main rotor with anti-torque tail rotor configuration that has become the most common helicopter configuration. Tandem rotor helicopters are also in widespread use due to their greater payload capacity. Coaxial helicopters, tiltrotor aircraft, and compound helicopters are all flying today. Quadcopter helicopters pioneered as early as 1907 in France, and other types of multicopter have been developed for specialized applications such as unmanned drones. The earliest references for vertical flight came from China. Since around 400 BC, Chinese children have played with bamboo flying toys (or Chinese top). This bamboo-copter is spun by rolling a stick attached to a rotor. The spinning creates lift, and the toy flies when released. The 4th-century AD Daoist book Baopuzi by Ge Hong (抱朴子 "Master who Embraces Simplicity") reportedly describes some of the ideas inherent to rotary wing aircraft. Designs similar to the Chinese helicopter toy appeared in some Renaissance paintings and other works. In the 18th and early 19th centuries Western scientists developed flying machines based on the Chinese toy. 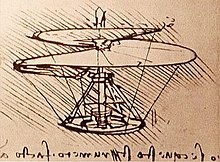 It was not until the early 1480s, when Italian polymath Leonardo da Vinci created a design for a machine that could be described as an "aerial screw", that any recorded advancement was made towards vertical flight. His notes suggested that he built small flying models, but there were no indications for any provision to stop the rotor from making the craft rotate. As scientific knowledge increased and became more accepted, people continued to pursue the idea of vertical flight. In July 1754, Russian Mikhail Lomonosov had developed a small coaxial modeled after the Chinese top but powered by a wound-up spring device and demonstrated it to the Russian Academy of Sciences. It was powered by a spring, and was suggested as a method to lift meteorological instruments. In 1783, Christian de Launoy, and his mechanic, Bienvenu, used a coaxial version of the Chinese top in a model consisting of contrarotating turkey flight feathers as rotor blades, and in 1784, demonstrated it to the French Academy of Sciences. Sir George Cayley, influenced by a childhood fascination with the Chinese flying top, developed a model of feathers, similar to that of Launoy and Bienvenu, but powered by rubber bands. By the end of the century, he had progressed to using sheets of tin for rotor blades and springs for power. His writings on his experiments and models would become influential on future aviation pioneers. Alphonse Pénaud would later develop coaxial rotor model helicopter toys in 1870, also powered by rubber bands. One of these toys, given as a gift by their father, would inspire the Wright brothers to pursue the dream of flight. In 1861, the word "helicopter" was coined by Gustave de Ponton d'Amécourt, a French inventor who demonstrated a small steam-powered model. While celebrated as an innovative use of a new metal, aluminum, the model never lifted off the ground. D'Amecourt's linguistic contribution would survive to eventually describe the vertical flight he had envisioned. Steam power was popular with other inventors as well. 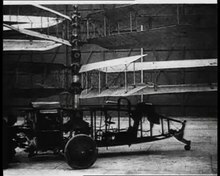 In 1878 the Italian Enrico Forlanini's unmanned vehicle, also powered by a steam engine, rose to a height of 12 meters (39 feet), where it hovered for some 20 seconds after a vertical take-off. Emmanuel Dieuaide's steam-powered design featured counter-rotating rotors powered through a hose from a boiler on the ground. In 1887 Parisian inventor, Gustave Trouvé, built and flew a tethered electric model helicopter. In July 1901, the maiden flight of Hermann Ganswindt's helicopter took place in Berlin-Schöneberg; this was probably the first motor-driven flight carrying humans. A movie covering the event was taken by Max Skladanowsky, but it remains lost. In 1885, Thomas Edison was given US$1,000 (equivalent to $28,000 today) by James Gordon Bennett, Jr., to conduct experiments towards developing flight. Edison built a helicopter and used the paper for a stock ticker to create guncotton, with which he attempted to power an internal combustion engine. The helicopter was damaged by explosions and one of his workers was badly burned. Edison reported that it would take a motor with a ratio of three to four pounds per horsepower produced to be successful, based on his experiments. Ján Bahýľ, a Slovak inventor, adapted the internal combustion engine to power his helicopter model that reached a height of 0.5 meters (1.6 feet) in 1901. On 5 May 1905, his helicopter reached 4 meters (13 feet) in altitude and flew for over 1,500 meters (4,900 feet). In 1908, Edison patented his own design for a helicopter powered by a gasoline engine with box kites attached to a mast by cables for a rotor, but it never flew. In 1906, two French brothers, Jacques and Louis Breguet, began experimenting with airfoils for helicopters. In 1907, those experiments resulted in the Gyroplane No.1, possibly as the earliest known example of a quadcopter. Although there is some uncertainty about the date, sometime between 14 August and 29 September 1907, the Gyroplane No. 1 lifted its pilot into the air about 0.6 metres (2 ft) for a minute. The Gyroplane No. 1 proved to be extremely unsteady and required a man at each corner of the airframe to hold it steady. For this reason, the flights of the Gyroplane No. 1 are considered to be the first manned flight of a helicopter, but not a free or untethered flight. That same year, fellow French inventor Paul Cornu designed and built a Cornu helicopter that used two 6.1-metre (20 ft) counter-rotating rotors driven by a 24 hp (18 kW) Antoinette engine. On 13 November 1907, it lifted its inventor to 0.3 metres (1 ft) and remained aloft for 20 seconds. Even though this flight did not surpass the flight of the Gyroplane No. 1, it was reported to be the first truly free flight with a pilot. [n 1] Cornu's helicopter completed a few more flights and achieved a height of nearly 2.0 metres (6.5 ft), but it proved to be unstable and was abandoned. In 1911, Slovenian philosopher and economist Ivan Slokar patented a helicopter configuration. The Danish inventor Jacob Ellehammer built the Ellehammer helicopter in 1912. It consisted of a frame equipped with two counter-rotating discs, each of which was fitted with six vanes around its circumference. After indoor tests, the aircraft was demonstrated outdoors and made several free take-offs. Experiments with the helicopter continued until September 1916, when it tipped over during take-off, destroying its rotors. During World War I, Austria-Hungary developed the PKZ, an experimental helicopter prototype, with two aircraft built. Silent film of a test flight of Pescara's helicopter, 1922. EYE Film Institute Netherlands. In the early 1920s, Argentine Raúl Pateras-Pescara de Castelluccio, while working in Europe, demonstrated one of the first successful applications of cyclic pitch. Coaxial, contra-rotating, biplane rotors could be warped to cyclically increase and decrease the lift they produced. The rotor hub could also be tilted forward a few degrees, allowing the aircraft to move forward without a separate propeller to push or pull it. Pateras-Pescara was also able to demonstrate the principle of autorotation. By January 1924, Pescara's helicopter No. 1 was tested but was found to be underpowered and could not lift its own weight. His 2F fared better and set a record. The British government funded further research by Pescara which resulted in helicopter No. 3, powered by a 250-horsepower (190 kW) radial engine which could fly for up to ten minutes. On 14 April 1924 Frenchman Étienne Oehmichen set the first helicopter world record recognized by the Fédération Aéronautique Internationale (FAI), flying his quadrotor helicopter 360 meters (1,180 ft). On 18 April 1924, Pescara beat Oemichen's record, flying for a distance of 736 meters (2,415 ft) (nearly 0.80 kilometers or .5 miles) in 4 minutes and 11 seconds (about 13 km/h or 8 mph, maintaining a height of 1.8 meters (6 feet). On 4 May, Oehmichen completed the first one-kilometer (0.62 mi) closed-circuit helicopter flight in 7 minutes 40 seconds with his No. 2 machine. In the US, George de Bothezat built the quadrotor helicopter de Bothezat helicopter for the United States Army Air Service but the Army cancelled the program in 1924, and the aircraft was scrapped. Albert Gillis von Baumhauer, a Dutch aeronautical engineer, began studying rotorcraft design in 1923. His first prototype "flew" ("hopped" and hovered in reality) on 24 September 1925, with Dutch Army-Air arm Captain Floris Albert van Heijst at the controls. The controls that van Heijst used were von Baumhauer's inventions, the cyclic and collective. Patents were granted to von Baumhauer for his cyclic and collective controls by the British ministry of aviation on 31 January 1927, under patent number 265,272. In 1927, Engelbert Zaschka from Germany built a helicopter, equipped with two rotors, in which a gyroscope was used to increase stability and serves as an energy accumulator for a gliding flight to make a landing. Zaschka's plane, the first helicopter, which ever worked so successfully in miniature, not only rises and descends vertically, but is able to remain stationary at any height. In 1928, Hungarian aviation engineer Oszkár Asbóth constructed a helicopter prototype that took off and landed at least 182 times, with a maximum single flight duration of 53 minutes. In 1930, the Italian engineer Corradino D'Ascanio built his D'AT3, a coaxial helicopter. His relatively large machine had two, two-bladed, counter-rotating rotors. Control was achieved by using auxiliary wings or servo-tabs on the trailing edges of the blades, a concept that was later adopted by other helicopter designers, including Bleeker and Kaman. Three small propellers mounted to the airframe were used for additional pitch, roll, and yaw control. The D'AT3 held modest FAI speed and altitude records for the time, including altitude (18 m or 59 ft), duration (8 minutes 45 seconds) and distance flown (1,078 m or 3,540 ft). In the Soviet Union, Boris N. Yuriev and Alexei M. Cheremukhin, two aeronautical engineers working at the Tsentralniy Aerogidrodinamicheskiy Institut (TsAGI or the Central Aerohydrodynamic Institute), constructed and flew the TsAGI 1-EA single lift-rotor helicopter, which used an open tubing framework, a four-blade main lift rotor, and twin sets of 1.8-meter (5.9-foot) diameter, two-bladed anti-torque rotors: one set of two at the nose and one set of two at the tail. Powered by two M-2 powerplants, up-rated copies of the Gnome Monosoupape 9 Type B-2 100 CV output rotary engine of World War I, the TsAGI 1-EA made several low altitude flights. By 14 August 1932, Cheremukhin managed to get the 1-EA up to an unofficial altitude of 605 meters (1,985 feet), shattering d'Ascanio's earlier achievement. As the Soviet Union was not yet a member of the FAI, however, Cheremukhin's record remained unrecognized. Nicolas Florine, a Russian engineer, built the first twin tandem rotor machine to perform a free flight. It flew in Sint-Genesius-Rode, at the Laboratoire Aérotechnique de Belgique (now von Karman Institute) in April 1933, and attained an altitude of six meters (20 feet) and an endurance of eight minutes. Florine chose a co-rotating configuration because the gyroscopic stability of the rotors would not cancel. Therefore, the rotors had to be tilted slightly in opposite directions to counter torque. Using hingeless rotors and co-rotation also minimised the stress on the hull. At the time, it was one of the most stable helicopters in existence. The Bréguet-Dorand Gyroplane Laboratoire was built in 1933. It was a coaxial helicopter, contra-rotating. After many ground tests and an accident, it first took flight on 26 June 1935. Within a short time, the aircraft was setting records with pilot Maurice Claisse at the controls. On 14 December 1935, he set a record for closed-circuit flight with a 500-meter (1,600-foot) diameter. The next year, on 26 September 1936, Claisse set a height record of 158 meters (518 feet). And, finally, on 24 November 1936, he set a flight duration record of one hour, two minutes and 50 seconds over a 44 kilometers (27 miles) closed circuit at 44.7 kilometers per hour (27.8 mph). The aircraft was destroyed in 1943 by an Allied airstrike at Villacoublay airport. Arthur M. Young, American inventor, started work on model helicopters in 1928 using converted electric hover motors to drive the rotor head. Young invented the stabilizer bar and patented it shortly after. A mutual friend introduced Young to Lawrence Dale, who once seeing his work asked him to join the Bell Aircraft company. When Young arrived at Bell in 1941, he signed his patent over and began work on the helicopter. His budget was US$250,000 (equivalent to $4.3 million today) to build two working helicopters. In just six months they completed the first Bell Model 1, which spawned the Bell Model 30, later succeeded by the Bell 47. Early rotor winged flight suffered failures primarily associated with the unbalanced rolling movement generated when attempting take-off, due to dissymmetry of lift between the advancing and retreating blades. This major difficulty was resolved by Juan de la Cierva's introduction of the flapping hinge. In 1923, de la Cierva's first successful autogyro was flown in Spain by Lt. Gomez Spencer. In 1925 he brought his C.6 to Britain and demonstrated it to the Air Ministry at Farnborough, Hampshire. This machine had a four blade rotor with flapping hinges but relied upon conventional airplane controls for pitch, roll and yaw. It was based upon an Avro 504K fuselage, initial rotation of the rotor was achieved by the rapid uncoiling of a rope passed around stops on the undersides of the blades. A major problem with the autogyro was driving the rotor before takeoff. Several methods were attempted in addition to the coiled rope system, which could take the rotor speed to 50% of that required, at which point movement along the ground to reach flying speed was necessary, while tilting the rotor to establish autorotation. Another approach was to tilt the tail stabiliser to deflect engine slipstream up through the rotor. The most acceptable solution was finally achieved with the C.19 Mk.4, which was produced in some quantities; a direct drive from the engine to the rotor was fitted, through which the rotor could be accelerated up to speed. The rotor clutch was then disengaged before the takeoff run. As de la Cierva's autogyros achieved success and acceptance, others began to follow and with them came further innovation. Most important was the development of direct rotor control through cyclic pitch variation, achieved initially by tilting the rotor hub and subsequently by the Austrian engineer Raoul Hafner, by the application of a spider mechanism that acted directly on each rotor blade. The first production direct control autogyro was the C.30, produced in quantity by Avro, Liore et Olivier, and Focke-Wulf. The production model, called the C.30A by Avro, was built under licence in Britain, France and Germany and was similar to the C.30P. It carried small movable trimming surfaces. Each licensee used nationally built engines and used slightly different names. In all, 143 production C.30s were built, making it by far the most numerous pre-war autogyro. Between 1933 and 1936, de la Cierva used one C.30A (G-ACWF) to perfect his last contribution to autogyro development before his death in late 1936. To enable the aircraft to take off without forward ground travel, he produced the "Autodynamic" rotor head, which allowed the rotor to be spun up by the engine in the usual way but to higher than take-off r.p.m at zero rotor incidence and then to reach operational positive pitch suddenly enough to jump some 6.1 meters (20 ft) upwards. Heinrich Focke at Focke-Wulf was licensed to produce the Cierva C.30 autogyro in 1933. Focke designed the world's first practical transverse twin-rotor helicopter, the Focke-Wulf Fw 61, which first flew on 26 June 1936. The Fw 61 broke all of the helicopter world records in 1937, demonstrating a flight envelope that had only previously been achieved by the autogyro. During World War II, Nazi Germany used helicopters in small numbers for observation, transport, and medical evacuation. The Flettner Fl 282 Kolibri synchropter—using the same basic configuration as Anton Flettner's own pioneering Fl 265—was used in the Mediterranean, while the Focke Achgelis Fa 223 Drache twin-rotor helicopter was used in Europe. Extensive bombing by the Allied forces prevented Germany from producing any helicopters in large quantities during the war. In the United States, Russian-born engineer Igor Sikorsky and W. Lawrence LePage competed to produce the U.S. military's first helicopter. LePage received the patent rights to develop helicopters patterned after the Fw 61, and built the XR-1. Meanwhile, Sikorsky settled on a simpler, single rotor design, the VS-300, which turned out to be the first practical single lifting-rotor helicopter design. After experimenting with configurations to counteract the torque produced by the single main rotor, Sikorsky settled on a single, smaller rotor mounted on the tail boom. Developed from the VS-300, Sikorsky's R-4 was the first large-scale mass-produced helicopter, with a production order for 100 aircraft. The R-4 was the only Allied helicopter to serve in World War II, when it was used primarily for search and rescue (by the USAAF 1st Air Commando Group) in Burma; in Alaska; and in other areas with harsh terrain. Total production reached 131 helicopters before the R-4 was replaced by other Sikorsky helicopters such as the R-5 and the R-6. In all, Sikorsky produced over 400 helicopters before the end of World War II. While LePage and Sikorsky built their helicopters for the military, Bell Aircraft hired Arthur Young to help build a helicopter using Young's two-blade teetering rotor design, which used a weighted stabilizer bar placed at a 90° angle to the rotor blades. The subsequent Model 30 helicopter showed the design's simplicity and ease of use. The Model 30 was developed into the Bell 47, which became the first helicopter certified for civilian use in the United States. Produced in several countries, the Bell 47 was the most popular helicopter model for nearly 30 years. In 1951, at the urging of his contacts at the Department of the Navy, Charles Kaman modified his K-225 synchropter — a design for a twin-rotor helicopter concept first pioneered by Anton Flettner in 1939, with the aforementioned Fl 265 piston-engined design in Germany — with a new kind of engine, the turboshaft engine. This adaptation of the turbine engine provided a large amount of power to Kaman's helicopter with a lower weight penalty than piston engines, with their heavy engine blocks and auxiliary components. On 11 December 1951, the Kaman K-225 became the first turbine-powered helicopter in the world. Two years later, on 26 March 1954, a modified Navy HTK-1, another Kaman helicopter, became the first twin-turbine helicopter to fly. However, it was the Sud Aviation Alouette II that would become the first helicopter to be produced with a turbine-engine. Reliable helicopters capable of stable hover flight were developed decades after fixed-wing aircraft. This is largely due to higher engine power density requirements than fixed-wing aircraft. Improvements in fuels and engines during the first half of the 20th century were a critical factor in helicopter development. The availability of lightweight turboshaft engines in the second half of the 20th century led to the development of larger, faster, and higher-performance helicopters. While smaller and less expensive helicopters still use piston engines, turboshaft engines are the preferred powerplant for helicopters today. 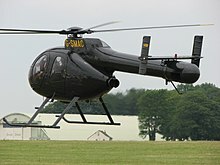 Due to the operating characteristics of the helicopter—its ability to take off and land vertically, and to hover for extended periods of time, as well as the aircraft's handling properties under low airspeed conditions—it has been chosen to conduct tasks that were previously not possible with other aircraft, or were time- or work-intensive to accomplish on the ground. Today, helicopter uses include transportation of people and cargo, military uses, construction, firefighting, Search and rescue, Tourism, medical transport, law enforcement, agriculture, news and media, and aerial observation, among others. They can be used for Reflection seismology or recreation. A helicopter used to carry loads connected to long cables or slings is called an aerial crane. Aerial cranes are used to place heavy equipment, like radio transmission towers and large air conditioning units, on the tops of tall buildings, or when an item must be raised up in a remote area, such as a radio tower raised on the top of a hill or mountain. Helicopters are used as aerial cranes in the logging industry to lift trees out of terrain where vehicles cannot travel and where environmental concerns prohibit the building of roads. These operations are referred to as longline because of the long, single sling line used to carry the load. The largest single non-combat helicopter operation in history was the disaster management operation following the 1986 Chernobyl nuclear disaster. Hundreds of pilots were involved in airdrop and observation missions, making dozens of sorties a day for several months. "Helitack" is the use of helicopters to combat wildland fires. The helicopters are used for aerial firefighting (water bombing) and may be fitted with tanks or carry helibuckets. Helibuckets, such as the Bambi bucket, are usually filled by submerging the bucket into lakes, rivers, reservoirs, or portable tanks. Tanks fitted onto helicopters are filled from a hose while the helicopter is on the ground or water is siphoned from lakes or reservoirs through a hanging snorkel as the helicopter hovers over the water source. Helitack helicopters are also used to deliver firefighters, who rappel down to inaccessible areas, and to resupply firefighters. Common firefighting helicopters include variants of the Bell 205 and the Erickson S-64 Aircrane helitanker. Helicopters are used as air ambulances for emergency medical assistance in situations when an ambulance cannot easily or quickly reach the scene, or cannot transport the patient to a medical facility in time. Helicopters are also used when patients need to be transported between medical facilities and air transportation is the most practical method. An air ambulance helicopter is equipped to stabilize and provide limited medical treatment to a patient while in flight. The use of helicopters as air ambulances is often referred to as "MEDEVAC", and patients are referred to as being "airlifted", or "medevaced". This use was pioneered in the Korean war, when time to reach a medical facility was reduced to three hours from the eight hours needed in World War II, and further reduced to two hours by the Vietnam war. Police departments and other law enforcement agencies use helicopters to pursue suspects. Since helicopters can achieve a unique aerial view, they are often used in conjunction with police on the ground to report on suspects' locations and movements. They are often mounted with lighting and heat-sensing equipment for night pursuits. Military forces use attack helicopters to conduct aerial attacks on ground targets. Such helicopters are mounted with missile launchers and miniguns. Transport helicopters are used to ferry troops and supplies where the lack of an airstrip would make transport via fixed-wing aircraft impossible. 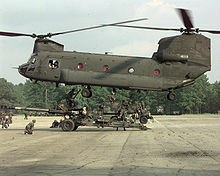 The use of transport helicopters to deliver troops as an attack force on an objective is referred to as "air assault". Unmanned aerial systems (UAS) helicopter systems of varying sizes are developed by companies for military reconnaissance and surveillance duties. Naval forces also use helicopters equipped with dipping sonar for anti-submarine warfare, since they can operate from small ships. Oil companies charter helicopters to move workers and parts quickly to remote drilling sites located at sea or in remote locations. The speed advantage over boats makes the high operating cost of helicopters cost-effective in ensuring that oil platforms continue to operate. Various companies specialize in this type of operation. NASA is developing the Mars Helicopter Scout, a 1.8 kg (4.0 lb) helicopter to be launched to survey Mars (along with a rover) in 2020. Given that the Martian atmosphere is 100 times thinner than that of Earth's, its two blades will spin at close to 3,000 revolutions a minute, approximately 10 times faster than that of a terrestrial helicopter. In 2017, 926 civil helicopters were shipped for $3.68 Billion, led by Airbus Helicopters with $1.87 Billion for 369 rotorcraft, Leonardo Helicopters with $806 Million for 102 (first three quarters only), Bell Helicopter with $696 Million for 132, then Robinson Helicopter with $161 Million for 305. By October 2018, the in-service and stored helicopter fleet of 38,570 with civil or government operators was led Robinson Helicopter with 24.7% followed by Airbus Helicopters with 24.4%, then Bell with 20.5 and Leonardo with 8.4%, Russian Helicopters with 7.7%, Sikorsky Aircraft with 7.2%, MD Helicopters with 3.4% and other with 2.2%. The most widespread model is the piston Robinson R44 with 5,600, then the H125/AS350 with 3,600 units, followed by the Bell 206 with 3,400. Most were in North America with 34.3% then in Europe with 28.0% followed by Asia-Pacific with 18.6%, Latin America with 11.6%, Africa with 5.3% and Middle East with 1.7%. 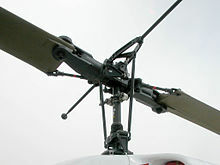 The rotor system, or more simply rotor, is the rotating part of a helicopter that generates lift. A rotor system may be mounted horizontally, as main rotors are, providing lift vertically, or it may be mounted vertically, such as a tail rotor, to provide horizontal thrust to counteract torque from the main rotors. The rotor consists of a mast, hub and rotor blades. The mast is a cylindrical metal shaft that extends upwards from the transmission. At the top of the mast is the attachment point for the rotor blades called the hub. The rotor blades are attached to the hub. Main rotor systems are classified according to how the rotor blades are attached and move relative to the hub. There are three basic types: hingeless, fully articulated, and teetering; although some modern rotor systems use a combination of these. Most helicopters have a single main rotor, but torque created by its aerodynamic drag must be countered by an opposed torque. The design that Igor Sikorsky settled on for his VS-300 was a smaller tail rotor. The tail rotor pushes or pulls against the tail to counter the torque effect, and this has become the most common configuration for helicopter design, usually at the end of a tail boom. Some helicopters use other anti-torque controls instead of the tail rotor, such as the ducted fan (called Fenestron or FANTAIL) and NOTAR. NOTAR provides anti-torque similar to the way a wing develops lift through the use of the Coandă effect on the tail boom. Tandem rotors are two counter-rotating rotors with one mounted behind the other. Coaxial rotors are two counter-rotating rotors mounted one above the other with the same axis. Intermeshing rotors are two counter-rotating rotors mounted close to each other at a sufficient angle to let the rotors intermesh over the top of the aircraft without colliding. Transverse rotors are pair of counter-rotating rotors mounted at each end of the wings or outrigger structures. Now used on tiltrotors, some early model helicopters had used them. Quadcopters have four rotors often with parallel axes (sometimes rotating in the same direction with tilted axes) which are commonly used on model aircraft. Tip jet designs let the rotor push itself through the air and avoid generating torque. The turbine engine for the Mi-2 helicopter. The number, size and type of engine(s) used on a helicopter determines the size, function and capability of that helicopter design. The earliest helicopter engines were simple mechanical devices, such as rubber bands or spindles, which relegated the size of helicopters to toys and small models. For a half century before the first airplane flight, steam engines were used to forward the development of the understanding of helicopter aerodynamics, but the limited power did not allow for manned flight. The introduction of the internal combustion engine at the end of the 19th century became the watershed for helicopter development as engines began to be developed and produced that were powerful enough to allow for helicopters able to lift humans. Early helicopter designs utilized custom-built engines or rotary engines designed for airplanes, but these were soon replaced by more powerful automobile engines and radial engines. 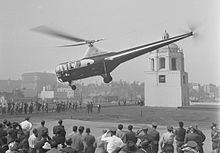 The single, most-limiting factor of helicopter development during the first half of the 20th century was that the amount of power produced by an engine was not able to overcome the engine's weight in vertical flight. This was overcome in early successful helicopters by using the smallest engines available. When the compact, flat engine was developed, the helicopter industry found a lighter-weight powerplant easily adapted to small helicopters, although radial engines continued to be used for larger helicopters. Turbine engines revolutionized the aviation industry, and the turboshaft engine finally gave helicopters an engine with a large amount of power and a low weight penalty. Turboshafts are also more reliable than piston engines, especially when producing the sustained high levels of power required by a helicopter. The turboshaft engine was able to be scaled to the size of the helicopter being designed, so that all but the lightest of helicopter models are powered by turbine engines today. Special jet engines developed to drive the rotor from the rotor tips are referred to as tip jets. Tip jets powered by a remote compressor are referred to as cold tip jets, while those powered by combustion exhaust are referred to as hot tip jets. An example of a cold jet helicopter is the Sud-Ouest Djinn, and an example of the hot tip jet helicopter is the YH-32 Hornet. Some radio-controlled helicopters and smaller, helicopter-type unmanned aerial vehicles, use electric motors. Radio-controlled helicopters may also have piston engines that use fuels other than gasoline, such as nitromethane. Some turbine engines commonly used in helicopters can also use biodiesel instead of jet fuel. There are also human-powered helicopters. A helicopter has four flight control inputs. 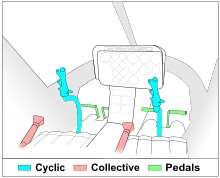 These are the cyclic, the collective, the anti-torque pedals, and the throttle. The cyclic control is usually located between the pilot's legs and is commonly called the cyclic stick or just cyclic. On most helicopters, the cyclic is similar to a joystick. However, the Robinson R22 and Robinson R44 have a unique teetering bar cyclic control system and a few helicopters have a cyclic control that descends into the cockpit from overhead. The control is called the cyclic because it changes the pitch of the rotor blades cyclically. The result is to tilt the rotor disk in a particular direction, resulting in the helicopter moving in that direction. If the pilot pushes the cyclic forward, the rotor disk tilts forward, and the rotor produces a thrust in the forward direction. If the pilot pushes the cyclic to the side, the rotor disk tilts to that side and produces thrust in that direction, causing the helicopter to hover sideways. The collective pitch control or collective is located on the left side of the pilot's seat with a settable friction control to prevent inadvertent movement. The collective changes the pitch angle of all the main rotor blades collectively (i.e. all at the same time) and independently of their position. Therefore, if a collective input is made, all the blades change equally, and the result is the helicopter increasing or decreasing in altitude. The anti-torque pedals are located in the same position as the rudder pedals in a fixed-wing aircraft, and serve a similar purpose, namely to control the direction in which the nose of the aircraft is pointed. Application of the pedal in a given direction changes the pitch of the tail rotor blades, increasing or reducing the thrust produced by the tail rotor and causing the nose to yaw in the direction of the applied pedal. The pedals mechanically change the pitch of the tail rotor altering the amount of thrust produced. Helicopter rotors are designed to operate in a narrow range of RPM. The throttle controls the power produced by the engine, which is connected to the rotor by a fixed ratio transmission. The purpose of the throttle is to maintain enough engine power to keep the rotor RPM within allowable limits so that the rotor produces enough lift for flight. In single-engine helicopters, the throttle control is a motorcycle-style twist grip mounted on the collective control, while dual-engine helicopters have a power lever for each engine. A swashplate controls the collective and cyclic pitch of the main blades. The swashplate moves up and down, along the main shaft, to change the pitch of both blades. This causes the helicopter to push air downward or upward, depending on the angle of attack. The swashplate can also change its angle to move the blades angle forwards or backwards, or left and right, to make the helicopter move in those directions. There are three basic flight conditions for a helicopter: hover, forward flight and the transition between the two. Hovering is the most challenging part of flying a helicopter. This is because a helicopter generates its own gusty air while in a hover, which acts against the fuselage and flight control surfaces. The end result is constant control inputs and corrections by the pilot to keep the helicopter where it is required to be. Despite the complexity of the task, the control inputs in a hover are simple. The cyclic is used to eliminate drift in the horizontal plane, that is to control forward and back, right and left. The collective is used to maintain altitude. The pedals are used to control nose direction or heading. It is the interaction of these controls that makes hovering so difficult, since an adjustment in any one control requires an adjustment of the other two, creating a cycle of constant correction. As a helicopter moves from hover to forward flight it enters a state called translational lift which provides extra lift without increasing power. This state, most typically, occurs when the airspeed reaches approximately 16–24 knots (30–44 km/h; 18–28 mph), and may be necessary for a helicopter to obtain flight. In forward flight a helicopter's flight controls behave more like those of a fixed-wing aircraft. Displacing the cyclic forward will cause the nose to pitch down, with a resultant increase in airspeed and loss of altitude. Aft cyclic will cause the nose to pitch up, slowing the helicopter and causing it to climb. Increasing collective (power) while maintaining a constant airspeed will induce a climb while decreasing collective will cause a descent. Coordinating these two inputs, down collective plus aft cyclic or up collective plus forward cyclic, will result in airspeed changes while maintaining a constant altitude. The pedals serve the same function in both a helicopter and a fixed-wing aircraft, to maintain balanced flight. This is done by applying a pedal input in whichever direction is necessary to center the ball in the turn and bank indicator. The main limitation of the helicopter is its low speed. There are several reasons a helicopter cannot fly as fast as a fixed-wing aircraft. When the helicopter is hovering, the outer tips of the rotor travel at a speed determined by the length of the blade and the rotational speed. In a moving helicopter, however, the speed of the blades relative to the air depends on the speed of the helicopter as well as on their rotational speed. The airspeed of the advancing rotor blade is much higher than that of the helicopter itself. It is possible for this blade to exceed the speed of sound, and thus produce vastly increased drag and vibration. At the same time, the advancing blade creates more lift traveling forward, the retreating blade produces less lift. If the aircraft were to accelerate to the air speed that the blade tips are spinning, the retreating blade passes through air moving at the same speed of the blade and produces no lift at all, resulting in very high torque stresses on the central shaft that can tip down the retreating-blade side of the vehicle, and cause a loss of control. Dual counter-rotating blades prevent this situation due to having two advancing and two retreating blades with balanced forces. Because the advancing blade has higher airspeed than the retreating blade and generates a dissymmetry of lift, rotor blades are designed to "flap" – lift and twist in such a way that the advancing blade flaps up and develops a smaller angle of attack. Conversely, the retreating blade flaps down, develops a higher angle of attack, and generates more lift. At high speeds, the force on the rotors is such that they "flap" excessively, and the retreating blade can reach too high an angle and stall. For this reason, the maximum safe forward airspeed of a helicopter is given a design rating called VNE, velocity, never exceed. In addition, it is possible for the helicopter to fly at an airspeed where an excessive amount of the retreating blade stalls, which results in high vibration, pitch-up, and roll into the retreating blade. During the closing years of the 20th century designers began working on helicopter noise reduction. Urban communities have often expressed great dislike of noisy aviation or noisy aircraft, and police and passenger helicopters can be unpopular because of the sound. The redesigns followed the closure of some city heliports and government action to constrain flight paths in national parks and other places of natural beauty. Helicopters also vibrate; an unadjusted helicopter can easily vibrate so much that it will shake itself apart. To reduce vibration, all helicopters have rotor adjustments for height and weight. Blade height is adjusted by changing the pitch of the blade. Weight is adjusted by adding or removing weights on the rotor head and/or at the blade end caps. Most also have vibration dampers for height and pitch. Some also use mechanical feedback systems to sense and counter vibration. Usually the feedback system uses a mass as a "stable reference" and a linkage from the mass operates a flap to adjust the rotor's angle of attack to counter the vibration. Adjustment is difficult in part because measurement of the vibration is hard, usually requiring sophisticated accelerometers mounted throughout the airframe and gearboxes. The most common blade vibration adjustment measurement system is to use a stroboscopic flash lamp, and observe painted markings or coloured reflectors on the underside of the rotor blades. The traditional low-tech system is to mount coloured chalk on the rotor tips, and see how they mark a linen sheet. Gearbox vibration most often requires a gearbox overhaul or replacement. Gearbox or drive train vibrations can be extremely harmful to a pilot. The most severe being pain, numbness, loss of tactile discrimination and dexterity. For a standard helicopter with a single main rotor, the tips of the main rotor blades produce a vortex ring in the air, which is a spiraling and circularly rotating airflow. As the craft moves forward, these vortices trail off behind the craft. When hovering with a forward diagonal crosswind, or moving in a forward diagonal direction, the spinning vortices trailing off the main rotor blades will align with the rotation of the tail rotor and cause an instability in flight control. When the trailing vortices colliding with the tail rotor are rotating in the same direction, this causes a loss of thrust from the tail rotor. When the trailing vortices rotate in the opposite direction of the tail rotor, thrust is increased. Use of the foot pedals is required to adjust the tail rotor's angle of attack, to compensate for these instabilities. These issues are due to the exposed tail rotor cutting through open air around rear of the vehicle. This issue disappears when the tail is instead ducted, using an internal impeller enclosed in the tail and a jet of high pressure air sideways out of the tail, as the main rotor vortices can not impact the operation of an internal impeller. For a standard helicopter with a single main rotor, maintaining steady flight with a crosswind presents an additional flight control problem, where strong crosswinds from certain angles will increase or decrease lift from the main rotors. This effect is also triggered in a no-wind condition when moving the craft diagonally in various directions, depending on the direction of main rotor rotation. This can lead to a loss of control and a crash or hard landing when operating at low altitudes, due to the sudden unexpected loss of lift, and insufficient time and distance available to recover. Conventional rotary-wing aircraft use a set of complex mechanical gearboxes to convert the high rotation speed of gas turbines into the low speed required to drive main and tail rotors. Unlike powerplants, mechanical gearboxes cannot be duplicated (for redundancy) and have always been a major weak point in helicopter reliability. In-flight catastrophic gear failures often result in gearbox jamming and subsequent fatalities, whereas loss of lubrication can trigger onboard fire. Another weakness of mechanical gearboxes is their transient power limitation, due to structural fatigue limits. Recent EASA studies point to engines and transmissions as prime cause of crashes just after pilot errors. By contrast, electromagnetic transmissions do not use any parts in contact; hence lubrication can be drastically simplified, or eliminated. Their inherent redundancy offers good resilience to single point of failure. The absence of gears enables high power transient without impact on service life. The concept of electric propulsion applied to helicopter and electromagnetic drive was brought to reality by Pascal Chretien who designed, built and flew world's first man-carrying, free-flying electric helicopter. The concept was taken from the conceptual computer-aided design model on 10 September 2010 to the first testing at 30% power on 1 March 2011 — less than six months. The aircraft first flew on 12 August 2011. All development was conducted in Venelles, France. Settling with power is when the aircraft has insufficient power to arrest its descent. This hazard can develop into Vortex ring state if not corrected early. Vortex ring state is a hazard induced by a combination of low airspeed, high power setting, and high descent rate. Rotor-tip vortices circulate from the high pressure air below the rotor disk to low pressure air above the disk, so that the helicopter settles into its own descending airflow. Adding more power increases the rate of air circulation and aggravates the situation. It is sometimes confused with settling with power, but they are aerodynamically different. Retreating blade stall is experienced during high speed flight and is the most common limiting factor of a helicopter's forward speed. Ground resonance is a self-reinforcing vibration that occurs when the lead/lag spacing of the blades of an articulated rotor system becomes irregular. Low-G condition is an abrupt change from a positive G-force state to a negative G-force state that results in loss of lift (unloaded disc) and subsequent roll over. If aft cyclic is applied while the disc is unloaded, the main rotor could strike the tail causing catastrophic failure. Dynamic rollover in which the helicopter pivots around one of the skids and 'pulls' itself onto its side (almost like a fixed-wing aircraft ground loop). Powertrain failures, especially those that occur within the shaded area of the height-velocity diagram. Tail rotor failures which occur from either a mechanical malfunction of the tail rotor control system or a loss of tail rotor thrust authority, called "loss of tail-rotor effectiveness" (LTE). Brownout in dusty conditions or whiteout in snowy conditions. Low rotor RPM, or "rotor droop", is when the engine cannot drive the blades at sufficient RPM to maintain flight. Rotor overspeed, which can over-stress the rotor hub pitch bearings (brinelling) and, if severe enough, cause blade separation from the aircraft. Wire and tree strikes due to low altitude operations and take-offs and landings in remote locations. Controlled flight into terrain in which the aircraft is flown into the ground unintentionally due to a lack of situational awareness. ^ Leishman, Dr. J. Gordon, Technical Fellow of AHS International. "Paper." 64th Annual Forum of the American Helicopter Society International, on the aerodynamic capability of Cornu's design, arguing that the aircraft lacked the power and rotor loading to lift free of the ground in manned flight. ^ GEN ἕλικος helikos (the κ being romanised as a c); see ἕλιξ and ἕλιξ (as an adjective). Liddell, Henry George; Scott, Robert; A Greek–English Lexicon at the Perseus Project. ^ πτερόν in Liddell and Scott. ^ Harper, Douglas. "helicopter". Online Etymology Dictionary. ^ For various reasons, the word is often erroneously, from an etymological point of view, analysed by English speakers into heli- and copter; see "helicopter". The Free Dictionary. ^ Cottez 1980, p. 181. ^ a b c d e Munson 1968. ^ Hirschberg, Michael J. and David K. Dailey, "Sikorsky" Archived 18 December 2007 at the Wayback Machine. US and Russian Helicopter Development In the 20th Century, American Helicopter Society, International. 7 July 2000. ^ Taking Flight: Inventing the Aerial Age, from Antiquity Through the First World War. Oxford University Press. 8 May 2003. pp. 22–23. ISBN 978-0-19-516035-2. ^ "Moments in Helicopter History (9) – Hermann Ganswindt". helikopterhysteriezwo.blogspot.jp. ^ a b "Patent US970616 - Flying-machine". Retrieved 30 March 2016. ^ Slovenska akademija znanosti in umetnosti. "Slokar, Ivan (1884–1970)". Retrieved 30 March 2016. ^ Občina Ajdovščina. "Ivan Slokar - letalski izumitelj, gospodarstvenik, jezikoslovec (1884 - 1970)". Retrieved 30 March 2016. ^ "Sto slovenskih znanstvenikov, zdravnikov in tehnikov (Open Library)". Retrieved 30 March 2016. ^ Taylor, Michael J. H. Jane's Encyclopedia of Aviation, p. 348. London: Studio Editions, 1989. ^ a b "FAI Record ID #13094 - Straight distance. Class E former G (Helicopters), piston Archived 6 October 2014 at the Wayback Machine" Fédération Aéronautique Internationale (FAI). Retrieved: 21 September 2014. ^ "New Helicopter Rises in Vertical Flight." Popular Science, November 1930, p. 70. ^ "Helicopter With Six Blades Succeeds In Tests." Popular Mechanics, March 1931. ^ "FAI Record ID #13093 - Straight distance. Class E former G (Helicopters), piston Archived 5 March 2016 at the Wayback Machine" Fédération Aéronautique Internationale (FAI). Retrieved: 21 September 2014. ^ Rumerman, Judy. "Helicopter Development in the Early Twentieth Century". Centennial of Flight Commission. Retrieved 28 November 2007. ^ Relly Victoria Petrescu and Florian Ioon Petrescu The Aviation History, p. 74. USA, 2013, ISBN 978-3-8482-6639-5. ^ "German Plane Promises New Stunts in Air, The Bee. Danville, Virginia, USA, June 25, 1927, p. 16". ^ "Asboth Helicopter." The Evening Post (New Zealand), 27 April 1935. ^ The first Hungarian helicopter (1929) on YouTube Retrieved: 12 December 2010. ^ "FAI Record ID #13086 - Straight distance. Class E former G (Helicopters), piston Archived 22 December 2015 at the Wayback Machine" Fédération Aéronautique Internationale (FAI). Retrieved: 21 September 2014. ^ Cheryomukhin TsAGI 1-EA (ЦАГИ 1-ЭА) first Soviet helicopter. 30 April 2012. Retrieved 30 March 2016 – via YouTube. ^ Savine, Alexandre. "TsAGI 1-EA." ctrl-c.liu.se, 24 March 1997. Retrieved 12 December 2010. ^ Watkinson 2004, p. 358. ^ "FAI Record ID #13059 - Straight distance. Class E former G (Helicopters), piston Archived 22 December 2015 at the Wayback Machine" Fédération Aéronautique Internationale (FAI). Retrieved: 21 September 2014. ^ "FAI Record ID #13084 - Altitude. Class E former G (Helicopters), piston Archived 7 February 2015 at the Wayback Machine" Fédération Aéronautique Internationale (FAI). Retrieved: 21 September 2014. ^ "FAI Record ID #13062 - Duration in closed circuit. Class E former G (Helicopters), piston Archived 7 March 2016 at the Wayback Machine" Fédération Aéronautique Internationale (FAI). Retrieved: 21 September 2014. ^ Day, Dwayne A. "Jacques Bréguet—Gyroplane-Laboratoire". Paragraph 10. Centennial of Flight. Retrieved 24 September 2015. ^ "American airplanes:Bell". www.aerofiles.com. 20 April 2009. Archived from the original on 2 January 2010. Retrieved 23 December 2009. ^ Brian Daugherty. "Former Pages from the North East Aircraft Museum". ^ "Autogyro History and Theory". ^ Day, Dwayne A. "Igor Sikorsky – VS 300." Centennial of Flight Commission, 2003. Retrieved 9 December 2007. ^ "Twin Turborotor Helicopter." Popular Mechanics, August 1954, p. 139. ^ "Helicopter Pilot Training Schools, Careers - Heliventures". heliventuresnc.com. Retrieved 1 April 2015. ^ Day, Dwayne A. "Skycranes". Centennial of Flight Commission. Retrieved 1 October 2008. ^ Webster, L.F. The Wiley Dictionary of Civil Engineering and Construction. New York: Wiley, 1997. ISBN 0-471-18115-3. ^ Butler, Bret W. et al. "Appendix A: Glossary: Fire Behavior Associated with the 1994 South Canyon Fire on Storm King Mountain, Colorado research paper." U.S. Dept. of Agriculture, Forest Service, September 1998. Retrieved 2 November 2008. ^ Kay, Marcia Hillary. "40 Years Retrospective: It's Been a Wild Ride" Rotor & Wing, August 2007. Accessed: 8 June 2014. Archived 8 June 2014 at the Wayback Machine. ^ n/a, n/a (11 May 2018). "Nasa will send helicopter to Mars to test otherworldly flight". BBC. Retrieved 11 May 2018. ^ "GAMA General Aviation Shipment Report 2017" (PDF). General Aviation Manufacturers Association. 21 February 2018. ^ "Helicopter market report Q3 2018". Flightglobal. 17 October 2018. ^ "Helicopter Yaw Control Methods". aerospaceweb.org. Retrieved 1 April 2015. ^ "Jay Leno's EcoJet Concept." businessweek.com, 2 November 2006. Retrieved 12 December 2010. ^ Skinner, Tony. "Eurosatory 2010: Industry celebrates first helicopter biofuel flight." shephard.co.uk, 17 June 2010. Retrieved 12 December 2010. ^ Croucher, Phil. Professional helicopter pilot studies page 2-11. ISBN 978-0-9780269-0-5. Quote: [Rotor speed] "is constant in a helicopter". ^ "Helicopters." Helicopter Vietnam. Retrieved: 16 February 2011. ^ Lombardi, Frank (April 2015). "Under the big top". Rotor & Wing. p. 48. Retrieved 12 April 2015. ^ Flying Magazine. January 1946. ^ Rotorcraft Flying Handbook 2007, pp. 3–7. ^ Loss of Tail Rotor Effectiveness, Dynamic Flight Inc. Accessed May 11, 2016. ^ Helicopter pedal turns, LTE and the Critical Wind Azimuth, Helicopter Flight Inc, Accessed May 11, 2016. ^ "Challenges of Aircraft Hybridization". IDTechEx. Retrieved 29 April 2013. ^ "Vertiflite, March/April 2012 - AHS Online Store". Vtol.org. Retrieved 28 April 2013. ^ "Helicopter Accidents in Hawaii." kauaihelicoptertoursafety.com. Retrieved: 12 December 2010. ^ "Accident Details (1982 Nicaragua Mi-8 crash)". PlaneCrashInfo.com. Retrieved 13 April 2018. ^ a b Cooper, Tom (29 September 2003). "Georgia and Abkhazia, 1992–1993: the War of Datchas". acig.org. Retrieved 12 December 2010. ^ "Crash Death, 3rd in 8 Years, Not Expected to Halt Future Shows". Los Angeles Times. 3 May 1993. Retrieved 12 December 2010. ^ "31 U.S. troops, 7 Afghans killed as insurgents down NATO chopper". LA Times. 6 August 2011. Retrieved 6 August 2011. ^ "Incident Date 050126 HMH-361 CH-53D – BuNo unknown – incident not yet classified – near Ar Rutbah, Iraq". Marine Corps Combat Helicopter Association (via popasmoke). 20 November 2007. Retrieved 12 December 2010. ^ "Record File n°11659". Fédération Aéronautique Internationale. Archived from the original on 3 December 2013. Retrieved 5 June 2013. ^ "Record File n°784". Fédération Aéronautique Internationale. Archived from the original on 5 January 2015. Retrieved 5 June 2013. ^ "Record File n°15171". Fédération Aéronautique Internationale. Archived from the original on 5 January 2015. Retrieved 5 June 2013. ^ "Record File n°754". Fédération Aéronautique Internationale. Archived from the original on 3 December 2013. Retrieved 10 September 2013. ^ "Record File n°9918". Fédération Aéronautique Internationale. Archived from the original on 5 January 2015. Retrieved 5 June 2013. ^ "Record File n°9917". Fédération Aéronautique Internationale. Archived from the original on 5 January 2015. Retrieved 5 June 2013. ^ "Record File n°11597". Fédération Aéronautique Internationale. Archived from the original on 5 January 2015. Retrieved 17 August 2012. ^ "Record File n°15629". Fédération Aéronautique Internationale. Archived from the original on 5 January 2015. Retrieved 17 August 2012. ^ "First electric helicopter". Guinness World Record. Retrieved 4 August 2011. ^ "Video: Canadians win long-unclaimed $250,000 prize for pedal-powered helicopter". John Stevenson. 22 July 2013. Retrieved 6 February 2014. Frawley, Gerard. The International Directory of Civil Aircraft, 2003–2004. Fyshwick, Canberra, Act, Australia: Aerospace Publications Pty Ltd., 2003, p. 155. ISBN 1-875671-58-7. Zaschka, Engelbert. Drehflügelflugzeuge. Trag- und Hubschrauber. Berlin-Charlottenburg: C. J. E. Volckmann Nachf. E. Wette, 1936. OCLC 20483709. Wikimedia Commons has media related to Helicopters. Look up helicopter in Wiktionary, the free dictionary. "www.helicopterpage.com - How Helicopters Work" Complete site explaining different aspects of helicopters and how they work. "Planes That Go Straight Up." 1935 article about early development and research into helicopters. "Flights — of the Imagination." 1918 article on helicopter design concepts. Graham Warwick (17 June 2016). "How The Helicopter Has Developed". Aviation Week & Space Technology. Getting from idea to reality took far longer for the helicopter than for the fixed-wing aircraft.